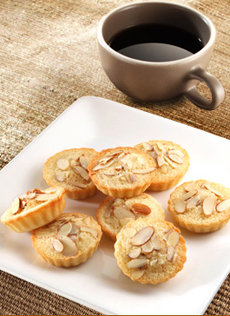 Financiers or French almond cakes were originally baked in the shape of gold bars. Find out why below. Photo courtesy of Donsuemor.com. This is Page 3 of an 8-page glossary of types of cake. Click on the links below to visit the other pages or click here to get to the Overview. After you’ve checked out the cakes, take a look at our other food glossaries—an easy way to get up to speed on more than fifty different food categories. Most related to this Cake Glossary are our Chocolate Glossary, Custard Glossary, Dessert Sauce Glossary, Ice Cream & Frozen Desserts Glossary and Sugar Glossary. This comprises to any number of very rich chocolate cake recipes that have rich, dense chocolate layers, rich chocolate fillings—often chocolate mousse—chocolate icing and chocolate decorations—chocolate shavings, molded chocolate, etc. A rich, chocolate layer cake with chocolate frosting. 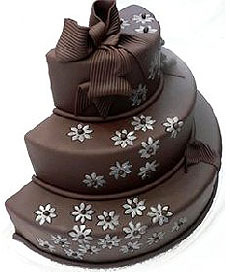 The cake is made with chocolate, not cocoa; the chocolate has a much higher fat content and thus provides more richness. This is what distinguishes a devil’s food cake from a regular chocolate cake, which is typically made with cocoa powder; some recipes also contain light brown sugar. According to the Oxford Companion to Food, the cake originated in the U.S. in the 20th century (the first printed recipe is from 1905). The addition of baking soda to a regular chocolate cake recipe causes the cocoa powder to redden, and hence gives the cake a red cast. 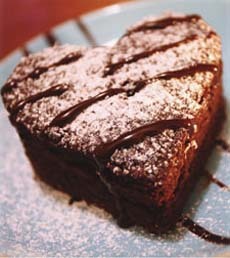 This devil’s food cake recipe was baked in a heart shape for Valentine’s Day. Such recipes, made with cocoa powder, were called “Red Devil’s Food Cake.” Often, devil’s food cake is confused with red velvet cake, also called red devil’s cake, which has a reddish color and only a mild flavor of cocoa. The two are not the same. See red velvet cake. 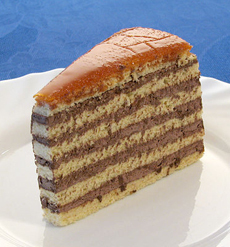 The Dobos (pronounced Dobosh) Torte is one of Hungary’s most famous cakes, created by pastry master József C. Dobos (1847-1924) in 1884. It is a five-layer almond sponge, although some are made with six and seven layers. The sponge is moistened with rum syrup (lemon, saffron or vanilla syrup can be substituted), filled with chocolate buttercream and topped with a layer of caramel (which helps to seal in the moisture). The buttercream-frosted sides of the cake are typically coated with crushed almonds. Historians say that the idea for a many-layered cake came from layered Middle Eastern pastries like baklava. Dough is a mixture of flour and liquid (water, milk, etc.) used for baking into bread or pastry. The mixture becomes thick and malleable when blended. Also see batter. A dump cake is a version of cobbler that’s easy to make, just by “dumping” the ingredients in a pan. It started with canned, drained fruit (cherries, pineapple, whatever) topped by a yellow or white cake mix poured over it. Add some pats of butter on top, and when the cake comes out of the oven it has a buttery top crust. No cutting, no rolling, no mixing: Just dump it in the oven and bake at 350°F until the top is a golden brown (35-40 minutes). 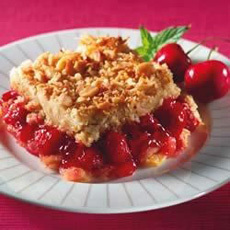 A classic dump cake made from cans of cherry pie fillling and crushed pineapple Here’s the recipe from Wilma Hunt | All Recipes. A classic fruitcake or plum cake baked on Election Day. The tradition dates back to the late 1700s in Connecticut. In those days, representatives from the various towns gathered in Hartford to cast and count the votes for state offices. Election Cakes were made to serve the out-of-town lodgers. Fruit cakes were less perishable, could be made in advance and held up through the procedures. 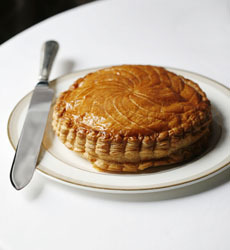 A French tradition to celebrate the feast of the Epiphany, January 6th. Puff pastry (pâte à choux) layers are filled with frangipane (almond cream), and a trinket is baked into the cake. The person who gets the slice with the trinket is named king or queen for the day. Variations of the cake include substituting brioche for puff pastry and using fillings of almond paste, chocolate ganache or sliced apples. Bakeries sell the cake with a gold paper crown for the “king.” More about Epiphany Cake, plus a recipe. A Hungarian cake named after General Ferdinand Walsin Esterhazy, a division commander in the Crimean War. Layers of buttercream and almond biscuit topped with fondant. The sides are decorated with more buttercream and sliced almonds. While the original recipe uses vanilla buttercream, chocolate is sometimes substituted. Layer cakes can be sandwiched with a variety of sweet fillings. Some common fillings are buttercream, cream cheese, custard ganache, jam, lemon curd, liqueur-flavored buttercream or whipped cream (amaretto, Grand Marnier, e.g. ), nut-flavored buttercream or whipped cream (hazelnut, pecan, pistachio, walnut, e.g.) and pure whipped cream. A rich French almond tea cake made from a sponge-like batter of brown butter, egg whites, flour, toasted ground almonds and powdered sugar. 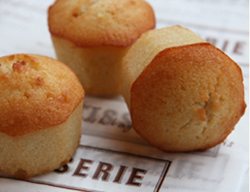 Financiers were created by a baker named Lasne in the financial district of Paris in the 1890s. Named after the rich financiers who frequented his bakery, Lasne created the little unglazed cake as finger food, to be enjoyed without utensils, and to be non-crumbly—no risk to the suit, shirt or tie of the nibbler. Financiers were traditionally baked in the shape of gold bars, but the rectangular shape was not as attractive as other shapes. A boat-shaped mold became favored, and today the cake ca take any shapes that appeals to the baker, from the octagon above to the fluted circle in the photo at the top of the page. In recent years, financiers have been elevated from breakfast and tea cake to the dessert menus of fine restaurants, with a variety of elegant garnishes. Literally, “flowers of Sicily,” Fiori di Sicilia is a very aromatic and flavorful combination of citrus and vanilla extracts. It adds a sophisticated and mysterious taste (it’s actually a very elegant variation of “creamsicle”) to pound cake, butter and sugar cookies, yellow cake, sweet breads, pie, meringues and more. Italians use it to scent panettone and pandoro. Buy a bottle as a gift for an avid baker. 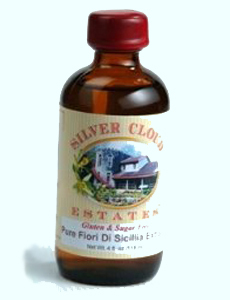 A bottle of fiori di Sicilia. Photo courtesy Silver Cloud Estates. Different types of flour are milled for different baking purposes. Protein content and gluten content will affect elasticity. The higher the protein content, the harder the flour. Bleaching produces a lighter, more aesthetic color. All-purpose flour (bleached or unbleached) is a blend of hard and soft wheats and has a protein content of 10% to 11%. It is ideal for hearty cookies, like chocolate chip and oatmeal, and some pastries. Bread flour, made from hard wheat, has a protein content of up to 15%. It is not used for cakes, but for chewy breads. Cake flour is made from bleached soft wheat, has a low gluten content and has a protein content of 7% to 8%. It creates a white cake with a delicate crumb, and is preferred for delicate cookies. Pastry flour has a moderate gluten content and a protein content of 8.5% to and 9.5%. It is used for many cakes and pastries. There are different types of flourless cake. One substitutes ground nuts for wheat flour. While the cake does not rise as high (it is more at a level with a German torte), the cakes are just as delicious and can be enjoyed by people with gluten allergies. Angel food cake is made only of egg whites (plus sugar, cream of tartar, salt and flavoring). Meringue cakes are also made only of egg whites, but unlike airy angel food cake, the meringue is a hardened form. 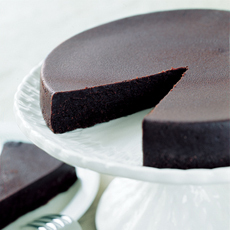 This flourless Chocolate Truffle Cake by David Glass is available at Zabars.com. A category of cake that includes airy cakes with little (if any) fat and a spongy texture; for example, angel food, biscuit (the European term for sponge), chiffon, génoise, meringue, roulade and sponge. These cakes have a high proportion of eggs to flour and no added fat, and, except for chiffon cakes, are leavened only by the air beaten into the eggs. Fondant is a coating for cakes that is made from sugar and water cooked to the soft-ball stage, then stirred or beaten to a creamy mass. It dries to a smooth, opaque matte finish and can be colored and/or flavored (chocolate or coffee, e.g.) or left white. It is formed into a dough, rolled out and laid over elaborate cakes (typically wedding cakes) or petit fours. It not only gives the cakes a smooth and elegant appearance, but acts as a preservative and protection: The dense fondant keeps the cake underneath moist for the extra day it may take to assemble and transport. Also, fondant does not mar easily like buttercream if it should be accidentally touched. The chocolate fondant covering this cake can be purchased on Amazon.com. While some people do not care for the thickness or flavor of fondant, it should be noted that commercial fondant, bought already prepared by many cake makers, does not achieve the quality of made-from-scratch fondant (it can be flavorless and gummy). Homemade fondant can be addictively delicious, especially to people who like marshmallows (think of marshmallows made by a fine confectioner versus the dry, flavorless mass-marketed varieties). Another type of fondant, poured fondant, is very smooth and shiny and typically used for decorating and filling cakes and pastries. There are still other types of baking fondant (such as sculpting fondant); and fondant has even more, very different, meanings in the world of confection. Read about them in our Chocolate Glossary. A marzipan-topped strawberry layer cake (think of it as the French version of strawberry shortcake). After the French word for strawberry, fraise, “le fraisier” is a classic French cake made with a sponge cake (génoise) base brushed with kirsch liqueur. The cake is filled with buttercream and fresh strawberries, which are generally sliced and placed to make an appealing design, and a layer of marzipan. 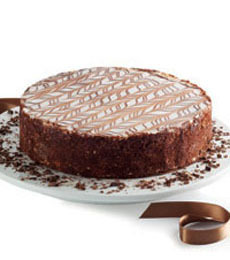 Variations use mousseline cream instead of buttercream and Grand Marnier or other liqueur. The classic is topped with a red almond paste or Italian meringue. 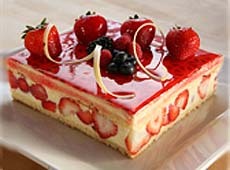 A beautiful fraisier from Tisserie.com. An almond-flavored pastry cream created in the 16th century by the Marquis Frangipani, a major general under King Louis XIV. It is a thick type of crème pâtissière, mixed with powdered almonds or crushed macaroons. It is also used as a filling for tarts and crêpes. Frangipane is the French spelling, frangipani the Italian. Frosting, used to cover the top and sides of a cake, and often as a filling between the layers, is typically made from sugar plus a fat such as butter and/or milk or cream. It is generally flavored with vanilla extract or other flavoring—cocoa powder, coffee, lemon, lime, orange, strawberry, etc. A vanilla frosting can be colored with food coloring, which adds gaiety without additional flavor. The difference between frosting and icing is that icing is made with confectioner’s sugar (also called icing sugar), but the two words are often used interchangeably. 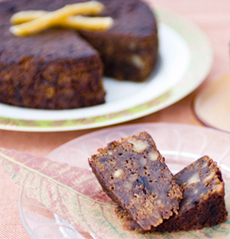 Fruitcakes are dense spice cakes packed with dried fruits, including raisins, and nuts. Brandy, sherry or whiskey can be added. The forerunners of fruitcake date back to Roman times; they evolved during the Middle Ages and became extremely popular by the 19th century, becoming the cake of choice to celebrate weddings and Christmas. Today, there is an industry in mass-produced Christmas fruitcakes with glazed dried fruits (notably, bright red and green cherries, diced citron, pineapple, orange and lemon peel) that are unappealing, re-gifted, and have become a comedian’s joke. An artisan or homemade fruitcake, made with top ingredients, is a gourmet delight. An organic fruitcake from Frog Hollow, a NIBBLE Top Pick Of The Week. Not a cake but a fried dough cookie topped with powdered sugar. 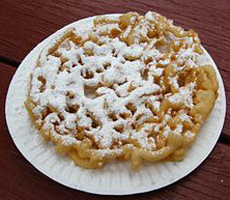 Funnel cake is a Pennsylvania Dutch specialty that has become popular at fairs and ballparks. See the other types of cookies. Funnel cake. Photo courtesy of Wikipedia.